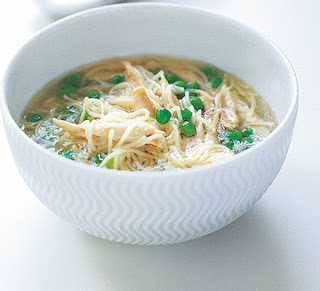 This is one of my all-time favorite soups. Perfect for a cooler day, for those of you who are still having a chilly Spring, or ANY day in my book! This is one of those recipes that I’ve tweaked and tweaked until I got it just how I want it to be. Boil chicken until fully cooked. Cook egg noodles. Dissolve 2 bouillon cubes in 1 cup boiling water. Add chicken broth and vegetables to the liquid until tender. 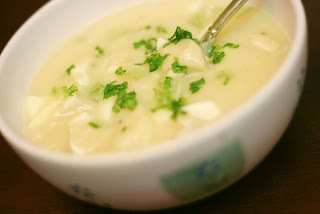 In separate bowl, whisk a half a can of cream of chicken soup and milk until smooth. Whisk soup and milk mixture into broth and vegetables. Melt butter then stir into flour. Add to soup mixture. Add chicken and noodles. Optional: Season to taste with salt & pepper or Schillings garlic & herb seasoning. 1 bulb of garlic, sliced in half across the cloves. Put the chicken wings into a large pan with the carrots, celery, onion and thyme, and cover with cold water. Bring to the boil, turn down to a simmer and cook for 1½ hours, skimming any impurities from the surface. Strain the broth through a colander, keeping the chicken wings but discarding the veg and herbs. Sieve the broth into a clean pan. Remove the meat from the wings when they've cooled a bit (discard the skin and bone), add back to the broth and re-heat. Cook the pasta in the broth, then add the peas and cook until tender. Season and serve. You can get organic or free range chicken wings from most supermarkets or butchers. They're very cheap and they make a good soup base. You could substitute organic chicken stock, but it's really no effort to make your own. Something about the slurpiness of noodles appeals to everyone. Place chicken breasts & bouillon cubes in a large pot & cover with 2 quarts of water. Bring to a boil, reduce heat to medium and simmer for 20-25 mins until chicken is done. Meanwhile, boil the eggs. Then mix together the bisquick and milk until soft dough forms. When chicken is done, remove from pot and set aside. Drop spoonfuls of dough into the chicken stock. Simmer over low heat, covered, for 10 mins, then uncovered for 10 mins. Meanwhile, dice 2-4 stalks of celery until you have approximately 1/2 – 1 cup of diced celery. Cut or shred chicken into bit sized pieces. Saute celery in 2 tbsp of butter for a couple of mins. Add in chicken & season well with salt and pepper. Stir to combine. Add the chicken and celery to the soup. Remove yolk from boiled eggs and chop whites and add to soup. Stir all to combine. Serves 4. 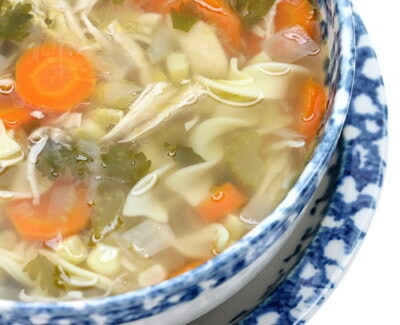 Classic chicken noodle soup is a comfort food suitable for any time of the year, but especially during cold winter months and when you are ill. 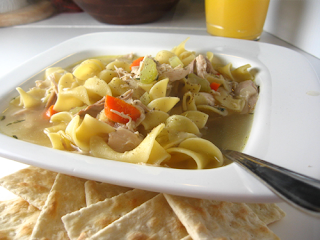 There is a reason why it is called Jewish penicillin! This version is made from scratch, so allow time to cook the chicken. Feel free to use this recipe as a guideline, using canned broth and pre-cooked chicken to save time. The soup may be made ahead and refrigerated or frozen. Heat the oil in a brothpot over medium heat. Add the onions, carrots, and celery and cook, stirring often, until softened, about 10 minutes. Cut the chicken into 8 pieces. If there are any pads of yellow fat in the tail area, do not remove them. Add the chicken to the pot and pour in the broth. Add enough cold water to cover the ingredients by 2 inches. Bring to a boil over high heat, skimming off the foam that rises to the surface. Add the parsley, thyme, and bay leaf. Reduce the heat to low. Simmer, uncovered, until the chicken is very tender, about 2 hours. Remove the chicken from the pot and set aside until cool enough to handle. Remove and discard the parsley and thyme sprigs and bay leaf. Let stand 5 minutes and degrease the soup, reserving the fat if you are making matzo balls. Make the stock: Place the chicken and chicken broth in a large stockpot and set it over medium heat. Roughly chop 2 carrots, 2 celery ribs, and 1 onion and add to the broth. Add the peppercorns, garlic, 2 sprigs of parsley, thyme, bay leaf, and enough water to just cover the chicken. Bring the broth to a boil, reduce heat to a simmer, and cook until the chicken is very tender -- about 1 1/4 hours -- skimming the surface periodically. Remove the chicken and place in a large bowl. Strain the broth through a very fine sieve into a large, clean bowl or stockpot. Discard the vegetables. Make the soup: Skim any fat off the top of the strained broth and discard. Slice the remaining carrots, celery, onions, and leeks into 1/4-inch-thick pieces and set aside. Remove and discard the skin and bones from the chicken, cut meat into 1/2-inch pieces, and set aside. Chop the remaining parsley leaves and set aside. Melt the butter in a large Dutch oven over medium heat. Add the vegetables and cook until the onions are translucent -- about 7 minutes. Add the chicken, the reserved broth, salt, and pepper. Simmer the soup until the vegetables are tender -- about 1 hour. Stir in the egg noodles and parsley and cook until the noodles are tender -- about 10 more minutes. Serve hot.